Le Pichet’s new vinegar barrel. 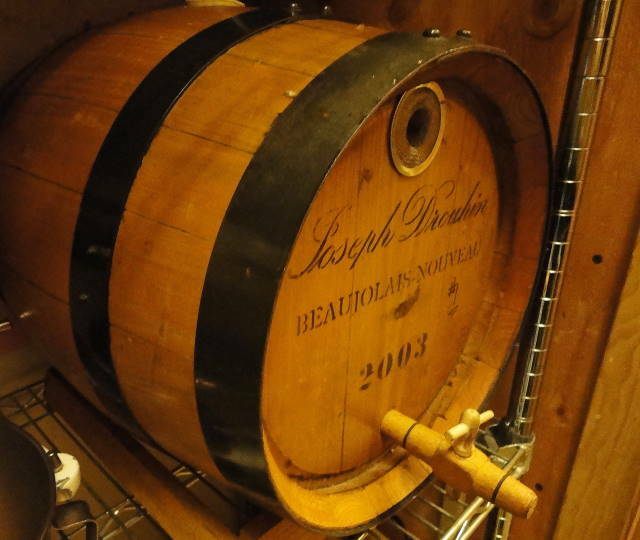 This 30 liter oak barrel, which once contained wine for Le Pichet’s annual Fete de Beaujolais Nouveau circa 2003, is now the home of our project to make our own vinegar. Last week, the project was launched with 2 liters of good quality red wine vinegar, heated to a boil and used to scald out the interior of the barrel. After that, 5 liters of robust young wine from the Languedoc were added. The barrel, which had been preliminarily soaked in many changes of cold water, both to remove any remaining wine from last decade and to cause the dry barrel staves to once again become water-tight, was then tucked into a warm closet. There it will rest, over the next 2 months, while slowly more wine is added until the barrel is 3/4 full. The results, to be confirmed by tasting (and PH testing), will hopefully be an ongoing 24 liter supply of oak-aged red wine vinegar. If the results are good, we hope to start a barrel for white vinegar as well, space allowing. This entry was posted in Stuff and tagged Le Pichet, Pickles and Preserves. Bookmark the permalink.